Adapted from a presentation to the Electrologist’s Association of Southern California, by Estela Basso, pharmaceutical chemist and founder, ESBA Laboratories, Inc. Many cosmetic procedures as well as minor medical procedures involve some degree of pain. For example, it is generally recognized that electrolysis, the permanent hair removal process by the use of electrolysis, produces considerable discomfort. Laser depilation promised painless hair removal, but in practice the application of the laser feels like a "rubber band snapping on the skin" (imagine that 60 times per minute) and could be unpleasantly cold when cooling devices are used. Permanent make-up application, tattooing, body piercing and waxing are all examples of procedures that involve considerable discomfort. the drug delivery systems into which these drugs are formulated to maximize their availability to the target tissue, the pain receptors buried deep in the dermis. "Pain comes with the Territory..."; "No Pain no Gain....", "If (my client) really wants to get rid of hair she will put up with it..."; "My treatment does not hurt (that bad)...";"I've always done it (without any topical anesthetic)..."
While these assertions and assumptions may be true for some clients and some electrologists, in general there is much to be gained by insuring your client is as comfortable as possible during the procedure. First of all, pain is not necessary to achieve your goal, which is to help your client get rid of unwanted hair. Therefore, the humanitarian, compassionate thing to do is to recommend to your client the use of a safe and effective topical anesthetic. You can't promise that she won't feel anything, because that is a set up for failure-but you can certainly say that it will take the edge out of it. I want to emphasize that the use of a topical anesthetic is something that you recommend your client to do, not something that you decide to do on your client. The administration of pharmaceutical drugs, even over-the-counter drugs, is considered a medical act. Only doctors, registered nurses (under doctor's orders) and parents of minors (Doctor Mom) are allowed to do that. The decision to use a topical anesthetic, an aspirin, or anything else, must be the client's. When your customer is more comfortable, so are you. This allows you to do a more precise, complete job, increasing your professional and personal satisfaction. Your client will allow longer treatment times, is more likely to complete her series of treatments and not to skip appointments. Best of all, will give you the best word of mouth referrals. Finally, remember that human beings will do more to avoid pain than to gain pleasure! In order to experience pain, two events need to happen: a) a sensitive fiber in the skin (or elsewhere) is stimulated, and b) the brain receives the message that this has happened. The transmission of the message from the site of the stimulus, to the brain, is called the conduction of the nervous impulse. Normally, in a resting fiber, there are sodium (NA+) ions, in the outside, and potassium (K+) ions in the inside. When the fiber is stimulated, it causes a special "gate" (a pore formed by proteins) in the nerve membrane, to open, allowing sodium ions to come in and potassium to flow out. This causes the next gate to open, then the next, and so on. The best analogy I have is the "wave" that people can make in stadiums, where one person puts her arms up, then the person sitting next to her, and so on. Nothing really moves, but the message or wave goes fast from one end to the stadium to the other end. This is similar to the manner a nervous impulse is transmitted to the brain. But when topical anesthetics are present, they interfere with the transmission of this message and we do not experience pain. Local anesthetics are substances capable of blocking the conduction of the nervous impulse. 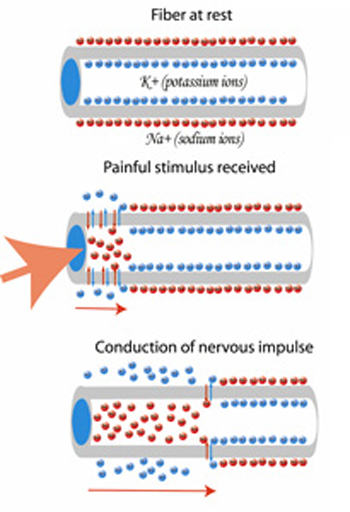 They bind to and block the sodium channels in the nerve membrane, therefore the "gates" cannot open. The message that painful stimuli occurred is not transmitted to the brain. These effects are reversible; after a while the drug diffuses away into the bloodstream and the nerve is capable of responding again. It is interesting to note that local anesthetics affect all the nervous fibers present in the skin, but at different rates, inversely proportional to their diameter. Luckily for the patient, the smallest (thinner) fibers are affected first, and these are the sensitive (pain conducting) fibers. The second ones to be affected are the temperature sensors that respond to heat or cold. The third ones are the touch sensors and finally, the deep pressure fibers. The order of loss of sensation goes from: pain>heat of cold>touch>deep pressure, explains why touch is not a good indicator for numbness. You could still feel that someone is touching an area, or applying pressure to it, even though the pain sensation is mostly gone. There is a type of substances that can also interfere locally with the phenomenon of pain, but which are not topical anesthetics. They are known as counterirritants, and are widely used in pain-relieving preparations. Common examples are menthol, camphor, capsaicin and methyl salicylate. They act by a different mechanism: they increase reversibly the blood supply to the area, creating a sensation of warmth (sometimes preceded by coolness). This interferes with the transmission of impulses by the smaller fibers, it "confuses" the pain receptors. Doctors use the same principle when they pinch, pat and/or shake the skin prior to an injection; the strong touch and pressure sensation does not allow the patient to fully respond to the painful stimuli. The application of cold is yet another example of this "interference" method to reduce the pain response. Drugs such as aspirin, acetaminophen, ibuprofen, or the opioids (morphine, codeine) are also analgesics, but they act on the brain, as opposed to the local anesthetics that act on the nerves. They bind to brain pain receptors and increase the pain threshold. In other words, they reduce the ability of the brain to respond to the pain stimuli. The most commonly used topical anesthetics belong to the same chemical group, the "caine" family. They are all chemical variations of the most famous (or infamous) "caine" of all: cocaine. Cocaine is a naturally occurring substance, used since ancient times by the indigenous people of the highlands of Peru-not because of its local anesthetic properties- but because of its ability to stimulate the central nervous system (CNS), creating sensations of euphoria, well-being and increased endurance. The Peruvian Indians chew it, and experience numbness in the mouth, including the tongue and lips. In the 1800s Freud and his colleagues became interested in cocaine and Freud used it to wean a colleague from morphine-with great success-but at the cost of creating the first well-documented case of cocaine addiction. The search for better alternatives to cocaine, led to the synthesis of many topical anesthetics. They belong to two closely related groups within the "caine" family: the ester group, which are derivatives of para-amino-benzoic acid (PABA) and the amide group. They differ in stability, potential to cause allergic reactions, solubility in water and lipids, potency, duration of action, and systemic toxicity. The members of the ester family are susceptible to hydrolysis (breakage of the molecule by water). This results in the production of the parent compound, PABA, which causes allergic reactions in a wide group of people. The amide type do not hydrolyze, and they rarely allergenic. Potency and duration of action for topical anesthesia are correlated with lipid solubility, as long as the molecule remains to some extent water-soluble, since water solubility is required for diffusion to the final site of action. Tetracaine, bupivacaine and etidocaine are the most liposoluble and therefore are the more potent and have the longer duration of action. Unfortunately, these agents are also the most toxic. The best balance between potency, lipophilicity, duration of action, and toxicity is achieved with lidocaine, prilocaine and mepivacaine. Of these, lidocaine is the most potent and as a result, it is the most widely used topical anesthetic. It has a long history of use, since it was first introduced in 1948. The toxic effects of topical anesthetics occur only if they reach the systemic circulation in excessive amounts. These effects are more likely to occur when the agents are injected (as in dental applications) than when they are applied to the skin. These compounds have a good safety margin and adverse reactions are quite rare. When toxicity occurs, it affects mainly the central nervous system (CNS) and the cardiovascular system. CNS effects include sleepiness, light-headedness, visual and auditory disturbances, and restlessness. At higher concentrations, nystagmus (rapid eye movements) and shivering may occur. Finally, tonic-clonic convulsions followed by central nervous system depression and death may occur with all local anesthetics, including cocaine. The cardiovascular effects of local anesthetics may include bradycardia (slow heart beat), hypotension (low blood pressure) and cardiovascular collapse leading to cardiac arrest. Certain alcohols and ketones exhibit local anesthetic properties. The most common include: benzyl alcohol, phenol, resorcinol and juniper tar. They all differ in potency and toxicity, and in general, they are less active and/or more toxic than the members of the "caine" family. The Food and Drug Administration (FDA) regulates the concentration and combinations of active principles that can be used in over-the-counter analgesic drug products. These products can be sold without a medical prescription. This information is published in the Code of Federal Regulations, Title 21 (21 CFR Part 348). Combinations of members of the "caine" family are not allowed without a prescription. That is the reason why EMLA cream that contains a combination of Lidocaine (2.5%) and Prilocaine (2.5%) is not an OTC preparation in the US (whereas is sold over-the-counter in Canada). Preparations containing Benzocaine can contain up to 20% of drug, whereas the maximum concentration of Lidocaine allowed for over-the-counter use on the skin is 4%. This reflects the relative potency of the drugs, since benzocaine is less potent and very poorly absorbed even through mucous membranes. In the particular case of the skin of the perianal region, to alleviate the pain for example of hemorrhoids, the FDA allows a maximum concentration of 5% for over-the-counter human use. The FDA does allow combinations of actives from the "caine" family with actives from the alcohols and ketones group as well as from the counterirritants group, but limits the concentrations of each that can be used. Compounding pharmacies may, upon request from a doctor, compound higher concentrations, but such products must be used only under direct medical supervision. The safety of these products has not been reviewed by the FDA (or any other organization), and constitute, de facto, unapproved drugs. Should any untoward effects occur, the responsibility lies squarely on the shoulders of the prescribing physician, who must then defend his decision to use a higher concentration buy proving that no satisfactory relief could be obtained by a commercially available and approved product. Arguing that a compounded, high concentration product may save some marginally significant time would hardly be a match to the risks involved. In all our previous discussion, we have focused on the identity of the active principle. However, this is only one part of an efficacious topical anesthetic. The active principle needs to be delivered from the surface of the skin where it is applied, to its site of action, the membrane of the sensitive fibers buried deep in the dermis. The mere presence of an active in a product is not assurance of performance. The role of a delivery system is to ensure that the right concentration of the right chemical is reaching the right site in the body for a sufficiently long period of time. An ideal topical anesthetic would have a very short lag time (time between application of the product on the skin and onset of effective numbness), achieve relevant concentrations at the nervous membrane so as to provide deep anesthesia, and be able to maintain that concentration for an adequate period of time. In anesthetics jargon one would say an ideal anesthetic has a quick onset, good depth and prolonged duration of effect. There are considerable obstacles to overcome to achieve this, and to understand them it is necessary to consider the structure of the skin and the routes of penetration through it. The skin consists of three layers: the most external is the stratum corneum. This is the greatest barrier to skin penetration for any substance. A useful analogy is a brick wall: it is composed of 15 to 40 overlapping layers of non-viable keratinocytes, the "bricks", surrounded by a "mortar" of lipids. Below this horny layer is the epidermis, a thin layer of living keratinocytes, and deeper still is the dermis, a loose tissue with higher water content where collagen and elastic fibers intertwine with fibroblasts, blood vessels and nervous fibers. Below the dermis lays the subcutaneous tissue, rich in blood supply and fat cells. The sensitive fibers are located deep in the dermis, and therefore a topical anesthetic needs to reach this area to be effective. There are three pathways available to any molecule attempting to cross the stratum corneum: 1) shunt pathway: through the openings of the hair follicles and sudoriferous (sweat) glands 2) intercellular route: through the intercellular spaces of the cornified keratinocytes (through the mortar) and 3) transcellular route: through the cornified cells themselves (through the bricks). The shunt pathway is of relatively minor importance, because its openings are only a very small fraction of the surface area of the skin. Small, charged molecules, and high molecular weight non-charged molecules, predominantly use the shunt route. The intercellular and transcellular pathways are the routes followed by the majority of molecules. The intercellular space in the stratum corneum is filled with lipid bilayers alternating with thin aqueous layers. The lipids that make up these bilayers are mainly composed of ceramides, cholesterol and free fatty acids. The transcellular pathway, the dead cornified cells, is composed of keratin (protein) fibers interspersed in a lipid matrix. The lipids that pervade the stratum corneum constitute a barrier to any molecule that is not liposoluble. Molecules that are only soluble in water are not able to penetrate, and the opposite is true: the more lipophilic a molecule is, the more easily it will penetrate. 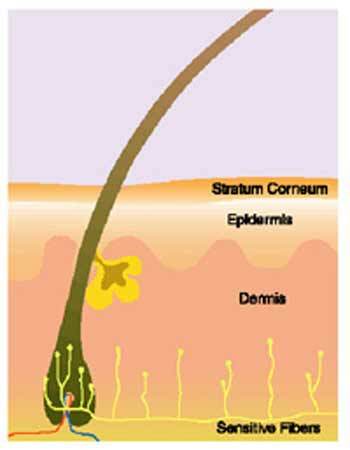 Once a molecule has crossed the stratum corneum, it reaches the viable epidermis, which is an environment rich in water. Here, a molecule needs to possess solubility in water, or change into a form that has it, or else it will not be able to penetrate further. The dermis is similar to the epidermis, in the sense that it is mainly a water-rich area. Another very important issue relating to drug delivery to the skin (dermal delivery) is the effect of blood uptake. Once the drug has crossed the stratum corneum, it reaches the epidermis and dermis, which possess an abundance of capillary blood supply. Drugs that penetrate the capillaries are taken away into the systemic circulation. This drug may not reach at all the intended site in the skin; in the case of topical anesthetics, the sensitive fibers. Instead the drug may reach other organs in the body where its effects are not desired (systemic side effects or toxic effects). On the other hand, when the skin is used as a portal for the administration of a drug to an internal organ (transdermal delivery), for example, in a hormone replacement patch, or in a nicotine patch, this blood uptake is desired and crucial. Most pharmaceutical drugs are weak bases and this means they can be formulated either as their salts (example: a hydrochloride salt of a drug) or as their free bases. Free bases are lipophilic and can penetrate the stratum corneum whereas the salt forms do not and require special delivery systems to do so. The melting point of a drug is also important because it correlates with its ability to penetrate the skin. The lower the melting point, the better the penetration is. This is a factor that is intrinsic to the drug, and cannot be changed by the formulator. However, in rare instances, a mixture of drugs, or drugs and inert ingredients, forms what is called a eutectic mixture. These mixtures have a lower melting point that either component by itself, and as a result, the combination has better skin penetration than its parts alone. This is the principle used in EMLA cream, which is a eutectic mix of lidocaine and prilocaine. 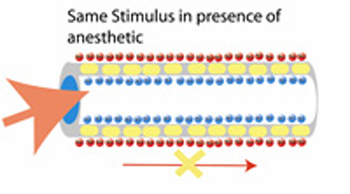 The diffusion rate of any substance through a membrane or barrier (including the stratum corneum) is proportional to the concentration gradient across that membrane. This simply means that the higher the concentration of drug in the vehicle, the higher the rate of penetration. If the drug is formulated in a very viscous vehicle, it has first to diffuse through this media before it can even become in contact with the skin. This will slow down the rate of penetration, especially at the beginning (will increase the lag time).The same is true when the drug is encapsulated in a polymer of any kind, or inside multilayered lipid vesicles like liposomes. Also, if the drug is present in an insoluble form (example: a solid suspended in the vehicle), it has to dissolve first in the vehicle, and then cross it, before it can begin penetrating the skin. This may slow down the process too. Ideally the drug would be dissolved at high concentration in the vehicle. Skin permeation enhancers are substances that temporarily and reversibly increase the permeability of the stratum corneum. In the minds of many, permeation enhancers are associated with DMSO (dimethylsulfoxide) and related solvents. These are mainly transdermal permeation enhancers, intended to facilitate penetration into the systemic circulation. They are excellent solvents for a wide range of drugs, have good affinity for the stratum corneum, and increase blood circulation in the skin. They are not useful when the intended site of action is in the skin. -substances which have a great affinity for the stratum corneum and that are good solvents for the drug increase drug penetration. Examples are certain low molecular weight alcohols and ethers. -substances that increase the fluidity of the stratum corneum lipids. This group is extensive and includes certain fatty acid esters, fatty alcohols, glycerin derivatives, non-ionic surfactants and many more. -substances that modify the level of hydration of the stratum corneum. Many substances penetrate partially the horny layer and then attract water to it, increasing its permeability. Examples are certain carbohydrates, both simple and polymeric, glycerin and certain derivatives, and many more. Vasoconstrictors are not permeation enhancers, but can be useful additives to the formulation since they reduce blood flow, and therefore, reduce loss of drug to the systemic circulation. They are most useful in dentistry when the local anesthetic is delivered directly into the dermis by injection. Vasoconstrictors penetrate poorly the stratum corneum, so their efficacy in topical preparations is questionable. Many therapeutic agents, from small molecules to peptides and some proteins, have been incorporated into lipid vesicles for topical application or targeting the systemic circulation. There has been a vast amount of research trying to understand the mechanism behind the lipid vesicular systems, different models have been proposed. Different results, often contradictory, have been reported. Some researchers have found increased absorption from lipid vesicles , leading to higher systemic levels. Others report an accumulation of actives in the skin, combined with decreased percutaneous absorption. Caution is required to interpret the results and generalize, because of the differences in type and composition of lipid products. Liposomes, niosomes (microvesicles) and transfersomes are examples of lipid vesicles. Liposomes are multilayered (multilamellar) vesicles and are capable of entrapping lipid-soluble or water-soluble drugs. The lipids used are typically phospholipids such as lecithin. A main disadvantage of liposomes is their instability, and the predisposition of phospholipids to oxidative degradation. Studies with radioactively or fluorescence-labeled phospholipids have shown that the liposomes disperse in the upper layers of the stratum corneum, without further penetration into the epidemics, dermis or deeper. No transport of lipids takes place across whole skin. Liposomes have an average diameter of 300 nm, and is unlikely that a vesicle that big could traverse the stratum corneum, which has an intercellular diameter of around 30 nm. The main use of liposomes is for delivery of active compounds and cosmetic ingredients to the stratum corneum itself. Niosomes (microvesicles) are similar to liposomes ,but are prepared from non-ionic surfactants. They tend to be smaller in diameter than liposomes, and may have unilamellar (one layer), or multilamellar structures. They are more stable and may provide faster penetration to the stratum corneum than liposomes. They do not go deeper either. Transfersomes are fairly new, and researchers claim that they can transport through pores five times smaller than theirs. Unlike liposomes, transfersomes appear to be highly deformable. They have been prepared using bile salt (sodium cholate) molecules. When liposomes are slightly larger that the pore diameter, the sieving effect makes it impossible for liposomes to go through the pores. This is not an obstacle for transfersomes. However, for them to do it is necessary that a driving force is present, such as partial dehydration of the skin. There are a variety of external ways to facilitate skin penetration of a topically applied product: exfoliation or peeling of the skin, defatting with lipid solvents, increasing the skin temperature, increasing the skin moisture, application of an electric current (iontophoresis) and more. Many of these methods may be irritating to the skin, uncomfortable for the patient, time-consuming, or combinations of these. A common method to help the penetration of a topically administered medication is to cover the application area with a dressing or patch of non-porous material such as plastic wrap. The dressing raises the skin temperature and traps perspiration. The increase in temperature causes the lipids in the stratum corneum to be more fluid, and therefore more permeable. The increase in moisture also makes the stratum corneum to be more permeable, because water is a plasticizer of keratin and a component of the intercellular route. On the other hand the increase in temperature is not so advantageous for local delivery since it increases the blood supply, and hence the amount of drug lost to the general circulation. The subjects of topical anesthesia and drug delivery systems are vast and complex, so by nature this review cannot be by any means exhaustive. My hope was to present the main ideas in an organized way so the modern practitioner can make a mode educated choice of topical anesthetic products and methodology to use in their practice. 1.- Goodman and Gilman's: The Pharmacological Basis of Therapeutics, 1980; pp 300-320. 2.- Katzung, Bertram G: Basic and Clinical Pharmacology, 1989; pp 315-321. 4.- Code of Federal Regulations, Tittle 21; Part 348. 6.- Man, Q.: Arch Dermatol., 1993; 129; pp 728-738. 7.- Wiechers, J.: Pharm Wkbl. Sci. Ed., 1989, 11; pp 185-198. 8.- Potts, R.: Pharm. Res., 1992, 9; pp 663-669. 9.- Barry, W.: Crit. Rev. Ther. Drug Carrier Sys., 1992,9(3-4); pp 305-53. 10.- Gorukanti, S. R.: Int. J. Pharm., 1999, 192 (2); pp 159-72. 11.- Finnin, B.C. : J. Pharm. Sci., 1999, 88 (10); pp 955-8. 12.- Wiechers, J.: Acta Pharm. Nord., 1992, 4(2); pp 123. 13.- Maghraby, E.: J. Pharm. Pharmacol., 1999, 51 (10); pp 1123-34. 14.- Hadgraft, J.: J. Semin. Dermatol., 1992, 11(2); pp 139-44. 15.- Egbaria, K.: Skin Pharmacol., 1990, 3(1); pp 21-8. 16.- Baillie, A. J.: J. Pharm. Pharmacol., 1989, 37; pp 863-868. 17.- Cevc, G.: Crit. Rev. in Therapeutic Drug Carrier Sys., 1996, 13 (3&4); pp 257-388.